What storage-related challenges are your customers chiefly concerned about? Sixty percent of our survey respondents cited storage I/O performance, making it the No. 1 concern. According to George Crump, president of Storage Switzerland LLC, when IT professionals say they have an I/O performance problem, what they really mean to say is that they have a problem with random I/O. "[The popularity of flash] is being driven by a couple of reasons. One is the whole virtual environment, whether it be virtual servers or virtual desktops. Because they're putting so many workloads on one single host, those workloads are now contending and sending a lot of random I/O," he said. That random I/O is something that hard drives are particularly bad at handling, since they have to rotate and spin. Flash storage, however, does well with high levels of random I/O because it doesn't need to move at all. "In the same fashion, as databases continue to scale and support more users, even if there's just one database on the physical server, it might have 10 or 20 times more users than it used to. And so this also generates this high level of random I/O," he said. Flash storage technology can squeeze more data into less space, using data deduplication and compression. "The combination of [deduplication and compression] typically makes flash in primary storage five times more efficient in data storage," he said. Flash is a dense technology and provides more raw capacity in less space. "Hard drives are quite big. They require a lot of power. They require a lot of air flow. Flash, for the most part, doesn't really need any of that." Organizations can run at higher percentages of capacity with flash storage. Back in the hard drive era, organizations would purchase a lot of hard drives, because more hard drives meant faster responses to I/O requests. The problem with this, Crump said, is that organizations weren't filling up the hard drives. But in a flash environment, organizations can run up high levels of utilization without penalty. 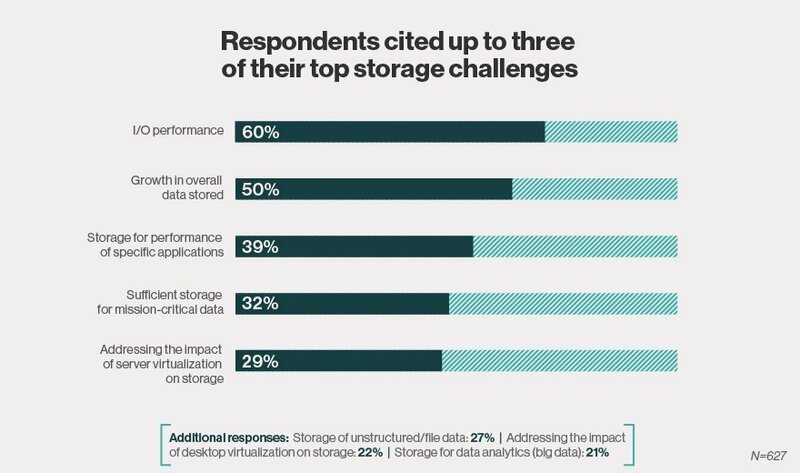 Following growth in overage storage, the third greatest challenge was storage for performance of specific applications, cited by 39% of respondents. Organizations typically will move databases such as Microsoft SQL Server and Oracle to flash storage because these applications result in high random I/O and might be directly responsible for revenue, Crump said. Virtual servers and virtual desktops are also good candidates for a move to flash, since they also generate high levels of random I/O. Organizations might also use flash for unstructured data to "accelerate big data analytics jobs," he said. What is a good use case for flash storage?